I had good fun over the weekend on our FB page. I often find that I've got too much to do socially over the weekend to get much playtime in and when I do I don't get enough time to write up a post so, as a little experiment I kept my 2nd monitor focused on the fan page to engage with anyone who wanted a chat. I like the format so I'm going to do it again when I can :) - I even got some good ideas for this week's posts which I'll get to but today, one item of news really caught my eye: chocolate bubbles! We've talked about Christmas before: I think one of the earliest blog mentions was at the end of Halloween. The time is nearly upon us now though. There's some speculation about this hike. It's a pretty pronounced spike and it's counteracted after with a sharp drop. My own theory is this is one big spender (or a conglomerate of big spenders) trying to create the bubble early. What do you think? Aside from the causes for this one spike, it's becoming quite obvious that bars of chocolate are going to be growing in value up to Christmas. I hope you all have some stacks waiting to sell! If not then I'd watch for chocolate dropping after a pronounced spike. 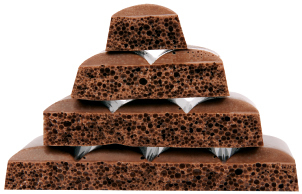 When these spikes appear and word spreads, chocolate hoarders will be looking to offload. Plenty of people do this in a silly fashion, unloading all their chocolate and undercutting like crazy. When enough of them do so the price takes a pretty sharp tumble. That's when you want to buy. Other investors will be watching the price and doing the same thing. The price will start to rise again. In fact, whatever force produced this first, pronounced price spike will likely keep doing so in the hope of making 25% (after fees) on thousands and thousands of chocolate. You can also buy a chunk in one of the troughs and hold on until the bubble is just about to burst then sell. On that note - we're looking at a bubble that bursts shortly before or just after the content drops so you'll want to sell at a peak before the Christmas event starts. Take your cue from the way pumpkins, ghost peppers and strawberries behaved just after that first Halloween cooking recipe teaser. What do you guys think! Share your thoughts. Looks like Christmas speculation is starting early. There will be more - I suspect it's a group acting to try to boost the potential of the bubble for the seasonal content. That's something a lot of people can take advantage of mind you. Cinnamon might be something to keep an eye. It's currently at a really low price (3c) with a really high supply (over 2,000,000 according to gw2spidy). It might be one of the main crafting ingredient for Christmas. Cinnamon is a safe bet for 'in demand' but the supply might not be in the same category as chocolate or butter (something that had a drop rate reduction). Still, it's probably going to be involved in Christmas somehow. Sage leaf, sage stuffing, onion possibly too - are these kinds of things Christmassy world wide (or America at least given Anet's locale)? They are in where I'm from. What do you guys think of Egg speculation. What is a more quintessential Christmas item than eggnog? I've invested in cinnamon, as it is super cheap, a few stacks of eggs, and I wish i bought more chocolate, but what can you do... hindsight is great. I also grab mint and cloves. I think eggs have potential - cloves too. I also wonder if there'll be any 'roast' meat recipes or speculation. Perhaps poultry or red meat. Those are both good ideas! Low supply... compared to some of the other cheap materials... and not a huge risk for loss if things go south. Especially the red meat. I was looking at poultry and noting the supply is totally different from red meat and a lot of the slabs of poultry just got bought up ^^ I'm wondering if it's a reader or other speculator. How so? Just interested in hearing your reasoning! I'm predicting Candy Cane mining nodes, to mine Candy Cane shards from. Unless Anet decides they don't want to flood the market with yet another dirt-cheap material. Candy Cane shards were a collectable drop from GW1, so i think it's very likely they'll exist in some form. I think Anet don't want to flood the market with yet another "evented" crafting material. Candy are a good thing for "most" of events so they may be used in some way during christmas. However I don't think they will be the main crafting material of christmas because it would be to "main stream" to do so and people may feel Anet is lazy about creating new stuff. aint walnuts a christmas themed cooking incredident too? At first I was ignoring them do due to massive supply, but then I thought, like the red meat, it is so cheap there is a low loss percentage if things don't work out. Also, the supply is large enough that Anet may consider doing something to increase their desirability, and what better time than X-mas? It's a gamble, but what the heck! "the ones the speculators choose i sell shortly before the event starts and the ones a-net chooses ill sell while the event is taking place right?" "If only these new recipes would pan out to be popular. (Ok, still bitter about the ghost peppers. But it was a good learning experience!)" :) Each scenario is it's own master but what we saw with the majority of the Halloween recipes was that most of the recipes didn't live up to the speculation "hype" - the bubble. man chocolate might hit 1s soon...how can it get so high? I know drop rates reduced but comon! Already seeing "some" movement on eggs! I just got to enjoy/witness quite the chocolate spike! From .89 to 2.31 in seconds! I even managed to score some profit for both my wife and myself. Has dropped back to 1.75 for now, but I'm keeping my eyes peeled! Damn i wish I had thought ahead and about some a week ago. have 9 sitting in bank is it heh i fail. Can it go higher? Yes, that's possible. I sold a large chunk of my chocolate at ~1s. I predicted a third spike and it turned out that I was being conservative. I'll look to buy back in if it drops again. Maybe 70c per is feasible. But if those driving this bubble do something stupid (unleash lots of chocolate at once) 70c will equate to a loss.